My Luther is the dog I’ve worked with longest – over 3 years. When he was first referred to AchyPaw, his Dads had run out of ideas to help with his increasing arthritis in his hips. He had gone off his back legs and they feared the worst. When their vet first told their Dads of us, they were a bit sceptical to say the least. His Instagram comment in 2015 was “Luther hardly moves but I’ve got a canine massage therapist coming on Saturday – I kid you not. Can’t quite believe I’ve even shared that – that’s SO Brighton”. 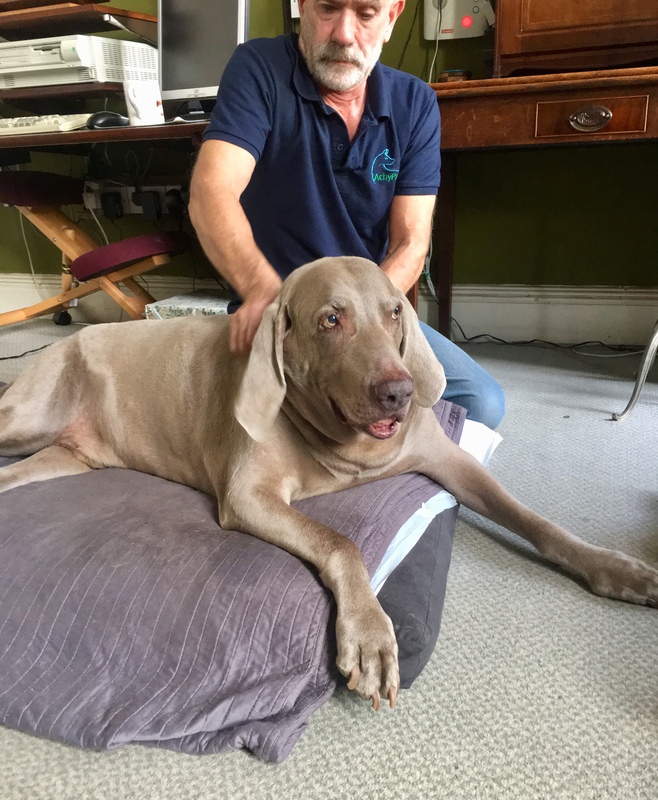 One week later a video of me massaging his handsome boy went up on the same Instagram feed (search #lutherweimaraner) with a comment of “Luther having his weekly massage with Dr Les. This stuff works!”. Well that didn’t take long to convince Dad did it? And 3 weeks later the comment went “Luther having his 3rd massage….Luther actually RAN along the road when he saw him”. So that’s Luther convinced too. Since then Luther and I have shared a journey. He still has his bad days – that’s the insidious nature of osteoarthritis. We’ve been through hydrotherapy and various medication regimes. On his really bad days, it’s easy enough to just get on the AchyPaw bike and go to give him an extra boost of massage benefit. His mobility is greatly helped by his Help’Em Up harness which he wears all day now. It gives him the confidence that he is not going to slip or fall as his Dads can support him from the front and back. Plus being massaged daily by his Dads benefits too and all the household adaptations they have put in place. He’s just celebrated his 13th birthday. He walks less than he used to 3 years ago – but so do I. 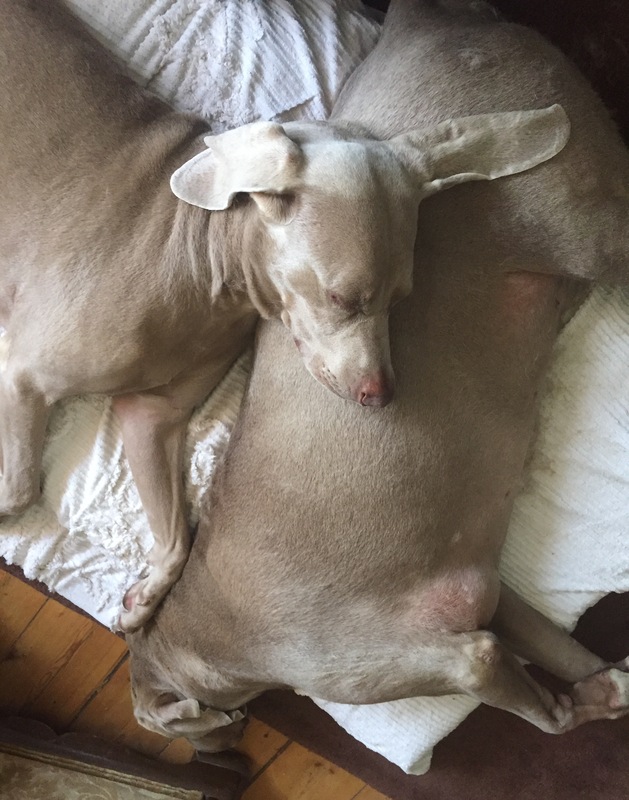 He has even gained a new brother, Hugo (Instagram #hugoweimaraner) who I spotted on Waifs & Strays website and thought would make a great addition to their family. The boys get on as though they have always been together. Massage sessions HAVE to be done with them both side by side. 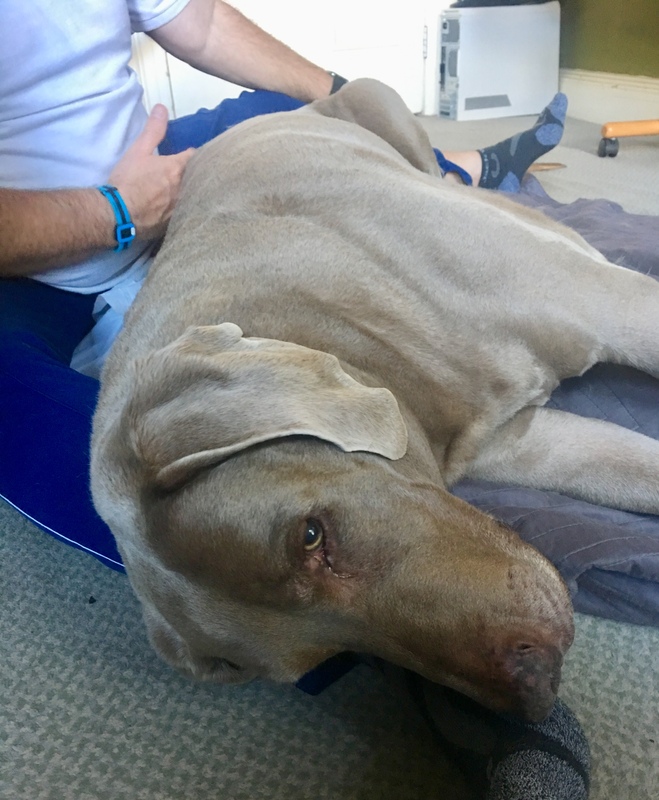 Every 4 weeks Hugo now gets his own massage from me while Chris works with Luther, or the other way round depending on which dog picks who. But on the days Chris is not there, his Dad massages him using the tools we have equipped them with over the years. Thanks for the journey Luther. Looking forward to much more. This entry was posted in acheypaw, achy paws, AchyPaw, achypaw myotherapy, arthritis management, canine arthritis, canine arthritis management, canine myotherapy, canine myotherapy, dog myotherapy, achypaw myotherapy, myotherapy, achy paws, Dog, dog harness, Dog massage, dog myotherapy, massage benefits, multimodal therapy for dogs, myofascial release, myotherapy, senior dogs, south coast myotherapy, therapeutic massage and tagged achy paws, achypaw, achypaw myotherapy, achypaws, arthritis management, canine arthritis management, Canine massage, canine myotherapy, Dog massage, dog myotherapy, massage, south coast dog massage, south coast myotherapy, therapeutic, therapeutic massage, www.achypaws.com. Bookmark the permalink.